The new Toyota Corolla hatchback has arrived in Australia offering more power, style and safety equipment than the top-selling model it replaces, plus the option of a hybrid powertrain across the range for the first time. However, the number of Corolla model grades shrinks from four to three and, in lieu of an entry-level Ascent variant (which previously opened the range at $20,190 plus on-road costs), base pricing opens $2680 higher than before at $22,870 plus ORCs for the Ascent Sport six-speed manual. That makes the cheapest 2018 Toyota Corolla hatch closer in price to the Volkswagen Golf (from $23,990) and Ford Focus ($23,390) than volume-selling small cars like the Mazda3 ($20,490) and Hyundai i30 ($19,990), as well as more expensive than the Honda Civic ($22,390), Renault Megane ($22,490) and Subaru Impreza ($22,600). Improving value across the range, however, is what Toyota claims is an unprecedented level of standard safety equipment in the small-car class, including autonomous emergency braking (AEB), lane departure alert with steering assist and – for CVT models – all-speed active cruise control. The new Corolla’s pre-collision safety system includes pedestrian detection at night and cyclist detection during the day. In a first for Toyota Australia, which says it expects the new Corolla hatch to achieve a maximum five-star ANCAP safety rating, a windscreen-mounted camera also recognises speed-limit signs. Other standard safety features include automatic high-beam, reversing camera, hill-start assist, seven airbags and two rear ISOFIX child safety seat anchor points, while SX and ZR models add blind-spot monitoring. There’s also more performance from a bigger engine for the first time in generations. The Corolla’s new 125kW/200Nm 2.0-litre four-cylinder petrol engine offers 21.3 per cent more power and 15.6 per cent more torque than the aged 100kW 1.8-litre it replaces. Despite this, ADR Combined fuel consumption falls to 6.0L/100km for CVT automatic transmission models and 6.3L/100km for the sole base manual. A new ‘Direct Shift’ CVT with 10-speed sequential shift mode and mechanical launch gear (a world-first for a passenger car, claims Toyota) costs $1500 extra on the entry-level Corolla Ascent Sport, but is standard on all other models. Likewise, satellite-navigation is a $1000 option on the base model but standard elsewhere. At the same time, Toyota Australia has made a petrol-electric hybrid powertrain optional across the three-variant Corolla hatch range (the redesigned Corolla sedan will follow next year) for the first time. The 2019 Toyota Corolla hybrid is priced from just $25,870 is Ascent Sport trim — $1660 less than the sole Corolla Hybrid it replaces and only $1830 more than Toyota’s most affordable hybrid, the Prius C (from $24,040). Hybrid power is now a $3000 option at base level and commands a premium of only $1500 on the mid-range Corolla SX and top-shelf ZR. As seen in the Toyota Prius, the new Corolla’s improved hybrid system combines a 72kW/142Nm 1.8-litre Atkinson Cycle petrol engine (with world-leading thermal efficiency of 40 per cent and 13:1 compression ratio) with a 53kW electric motor to deliver combined power output of 90kW. Powered by a Nickel Metal Hydride (Ni-MH) battery pack behind the rear seat, the electric motor helps reduce average fuel consumption to just 4.2L/100km. In contrast to all other new Corolla hatch variants, the ZR comes in for a price cut to $30,370 — $1550 less than before and $3500 more than the SX, while the ZR hybrid tops the range just $1500 higher at $31,870. The entry-level Toyota Corolla Ascent Sport comes standard with 16-inch alloy wheels, an 8.0-inch touch-screen, six-speaker multimedia system with Toyota Link voice control via Bluetooth, 4.2-inch multi-info display, air-conditioning, driver’s seat height adjustment and heated exterior mirrors. In addition, Ascent Sport hybrid models gain dual-zone climate control and keyless smart entry and start. These two features are standard on the mid-level Corolla SX petrol and hybrid, which cost an extra $2500, share their equipment list and add wireless phone charging, DAB+ digital radio, front fog lights, paddle shifters, premium multi-function steering wheel and shift lever, privacy glass, front fog lights, privacy glass and a rear USB port. Topping the 2019 Toyota Corolla hatch line-up is the ZR, which adds a large colour head-up display, 18-inch alloys, bi-LED headlights, heated sports front seats with leather and suede accents, eight-speaker premium JBL sound, 7.0-inch colour driver’s display, ambient illumination and electro-chromatic rear-view mirror. “This all-new Corolla hatch leapfrogs everything in the affordable small-car segment and sets the new benchmark,” said Toyota Australia vice-president of sales and marketing Sean Hanley. 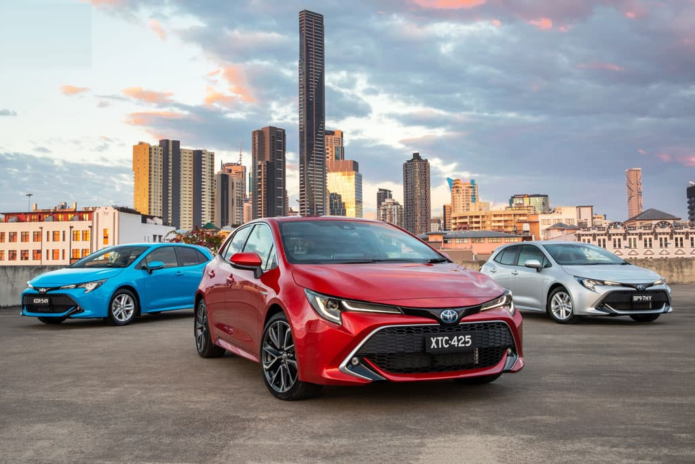 “Corolla has become the world’s and Australia’s best-selling passenger car and the new Corolla hatch is even better through our commitment to produce more appealing and dynamic cars. The new Corolla hatch is based on the latest Toyota New Global Architecture (TNGA) platform, which brings a 40mm longer wheelbase, new multi-link rear suspension, upgraded MacPherson strut front suspension, lower centre of gravity, 60 per cent greater body rigidity, improved weight balance and 25mm-wider cabin. Other new features include LED tail-lights and an active cornering assist system that applies brake force to the left or right driven wheels during high-speed cornering to suppress understeer. A full-size alloy spare wheel is standard only with the base petrol Ascent Sport (a temporary spare is standard in hybrids except the ZR, which gets a repair kit). Eight exterior paint colours are available, including Crystal Pearl, Glacier White, Silver Pearl, Eclipse and, for an extra $550, Volcanic Red and Peacock Black metallic plus Eclectic Blue and Oxide Bronze mica. Capped-price servicing costs a maximum of $140 per service and the Corolla comes with Toyota’s Australia’s sub-par three-year/100,000km warranty. Ranging in kerb weight from 1320 to 1400kg, the new Toyota Corolla hatch is 45mm longer, 40mm lower and 30mm wider than its predecessor, which was Australia’s most popular car for five years running. Making it the world’s top-selling car, the Corolla (an Auris, as the hatch is known in Europe) has found about 45 million homes since 1966, including around 1.4 million in Australia over the past 51 years. How much does the 2018 Toyota Corolla hatch cost?